If you follow our news, you will know we had an extremely successful event in Jerry during February. I’m delighted to say we have been invited back for a 3 day course in October/November, during the half term holiday. There is the opportunity to stay at Chateau Vermont where the course is held. Jersey is an excellent place for a family holiday and I’m sure it will appeal to families with young flute players. We might also be able to arrange for young players who want to come on their own or with a friend to travel from Gatwick with Flutewise staff or with families going. If you are interested, you can complete a form on our website. For many, many years I’ve been running a summer school in Kastela, Croatia. I’ve always been thrilled at the number of British families who have come to join in the course and enjoy a holiday and this year is promising to be no exception. The course is during the 2nd two weeks of August this year. Let me know if you want to come. It’s a great experience to work and play with Croatian flute playing friends. One of our dedicated Flutewise supporters has offered to offer any help and advice. Do you ever have a problem with your flute playing and just don't know where to turn? The internet is telling you a thousand different things and you don't know what advice to take? Dr Flautus is here to help! Whatever the issue with your fluting you will get clear and straightforward help. Whether it's trouble with a tricky bar or general problems with Time signatures or breathing. Dr Flautus will know exactly what to do! With regular advice and suggestions Dr Flautus is the best person to ask! I’m busy working on more events and I should have some to announce soon. I hope to see you soon. If you have a question please use the form below - it will come direct to Flutewise and your full name and email address will not appear on our website. Leaving home at 3.00 am on a Saturday morning at the beginning of February was not a particular pleasant experience, but it was so worth it! Mike Mower, Cathy Hare and I were invited to Jersey to deliver a weekend of Flutewise activities. Claire Harvey had planned it all along with her flute player/teacher husbands, Andy and pianist Chris George was also involved. Lots of planning had gone on before hand - Mike and Chris had even tried to rehearse on Skype (it didn’t work!). The venue was/is amazing. The Jersey Academy of Music is housed in Chateau Vermont in St Saviour, Jersey. Mike, Cathy and I were sleeping there and I’m not going to tell you what our bedrooms were like because you would be soooo jealous! We had a lovely group of young flute players come along to take part and we did all the usual Flutewise activities - warm up, ensemble playing, creative music making, Mike taught us improvisation, Cathy worked on tone. Mike wrote a few extra parts to his excellent Township Time from his Junior Musical Postcards book and this went down a storm. While Mike and Cathy rehearsed in the afternoon with Chris for the evening concert, I taught everyone with extended techniques needed for Ian Clarke’s Walk Like This and then we rehearsed the piece. The young flute players did so well and loved it. As they were enjoying it so much we decided not to use it for the evening concert but to keep it for the concert on Sunday so we could enjoy it for longer. The concert was wonderful on Saturday evening, we had a great audience. Sunday morning dawned and it was off to work again. It was lovely doing a second day as everyone knew each other and bonded well. One of the highlights was working on The Purple Cow. If you’ve been to a Flutewise event before you might have experienced this - it’s a poem, with a simple round which we use to create a performance. Every performance turns out differently and everyone works very hard and really enjoys it. Something else the young players really loved over the weekend was Erik’s Game or ‘piccolo’. Now if you haven’t played that yet, you really need to. Get to the next Flutewise event. Over the weekend we had lots of fun, heard sublime and exhilarating playing from Mike and Cathy, learnt lots of new techniques (including a bit of beatboxing) and thoroughly enjoyed exploring Mike’s music and learning a bit about improvisation. A big thank you to everyone who came along - including Ava and Mabel who came from London - and thank you to Mike and Cathy and to the people who made it possible, Claire, Andy and Chris. Mike and I were last in Jersey for a Flutewise event in 1998! Flutewise has plans to go back during October half term for a 3 day course - watch the website for details! I've had some birthday messages that I thought you'd like to see. Flutewise is 30! Hip Hip Hooray! An exciting event I really must say! but you can still get involved! it's never too late! to make lots of Music and make lots of new friends. You'll learn loads of stuff and have a real hoot! and fun games with your flute! Flutewise is awesome! it really is! great for young Flautists.. so thank you to Liz! And enjoy playing your flute in a thousand and one ways!! Happy birthday, Flutewise :). So pleased to hear that Flutewise has reached this milestone. I personally had many amazing experiences at events led by Flutewise, even though I was surrounded by a very much younger generation of flute players. It didn't faze me at all because we all had one thing in common, playing the flute, making music and having fun. May I wish Flutewise many many more years of playing, a great group for the budding flute players:). Enjoy the year as you celebrate. 30 years! A bit of history. If you read the previous post, you will know we've had our first Flutewise event of 2018. That means Flutewise has reached its 30th anniversary! I'm thrilled, amazed, stunned and a 101 other emotions to have reached this milestone. 30 years is such a long time, I do find it hard to believe. To have reached this point has taken so much amazing work (virtually all of it voluntary) by so many supportive people. It has been the most amazing fun. That was always my aim with Flutewise - to motivate and inspire people to play the flute and make music and have fun doing so. I remember way back in 1988 so very well. Most of the year was spent planning, thinking and learning new skills. One of the most important jobs was coming up with a name. We drew up a list of about 30 or 40. My husband suggested Flutewise. It was influenced by my like of owls. My very great fried, Sue Besly (another flute player) and I had spent a happy holiday in Gibraltar together and we had filled some of our time looking for an ornament of an owl playing the flute. We didn't find one. I've rather a lot now! Flutewise started life as just a magazine aimed at young flute players. My learning curve was huge. I'd never been involved in such a thing and I had to learn everything involved from scratch. I was so grateful to Simon Hunt, another flute player and publisher of flute music - Pan Educational Music. Simon introduced me to James Ledward, a printer (and musician) of music who had a print works near me in Hove. I think it is true to say James and his printer, Robin, taught me almost everything I know about print. Life was very different in 1988. No internet - no emails or websites. Mobile phones were very rare and had HUGE batteries - you needed two hands to carry them and the signal was rubbish. Printing was also so different. I would draft the magazine and using 'cut and paste' set it out. It was literally printing out words from a typewriter and, slightly later, a computer, cutting them out and placing and sticking them where I wanted them to go, leaving spaces for photos or drawings. Drawings were so important in those days as they were easier and cheaper to print. My good friend Wendy Standen was our artist from the beginning and produced so many wonderful covers and illustrations. I would then take my draft to James and he would set it out more carefully, making sure everything was lined up and then inserting the photos from negative images. The document was then made into a plate and then a negative image made. A proof was made and once approved, the magazine was printed from the image. It wasn't until late in 1989 I bought our first computer. It still sits on a shelf in my office. It's an iconic Apple MacintoshPlus. It cost £1066, a huge amount of money in those days. The next week we needed to go back and spend another £464 on a hard drive - it was operated by floppy disks and took forever to load. That computer could do so little, especially compared to what a mobile phone can do today. It managed word processing, a simple database and a painting programme. Those were the days. The first magazine was printed over the Christmas holiday at the end of 1988 and sent out in the January 1989 - this gives me the excuse to celebrate 30 years over 2 years, 2018/2019! So now 30 years on I'm spending the year trying to plan something really, REALLY BIG for all of our lovely flute players. I hope I manage it, with help maybe I will. There will be plenty of Flutewise events this year involving so many wonderful people who have been involved over all of these years. I'm thrilled that so many people who have been involved with Flutewise as children are now grown up, but they are still involved. I'm grateful to every single person who has ever been involved in Flutewise - I'm mentioning no names as the list would be too long and I'd hate to miss anyone out. Some people have been/are much more involved than others, but thank you to everyone. A big thank you also to the unsung heroes, our Trustees, a great group of people who make sure everything I do with Flutewise is 'on track'. Last Sunday, 14 January, we held our first Flutewise event of the year at the wonderful Kent College, Canterbury with Abbie Burrows, Gareth McLearnon and myself. Enormous thanks goes to Jane O'Neill (flute teacher) and Julian Ross (head of music) for making it possible to happen. Below is a write up of the event by Julian. A wonderful day of music making at Kent College, when as well as many of our own pupils, we also welcomed young flautists from all around the Canterbury area to participate in ‘The Really Flutewise’ event. Workshops took place throughout the day with internationally renowned flautist Abby Burrows and multi-award winning flautist, composer and arranger Gareth McLearnon. Through fun group activities, the children learnt new techniques, skills for practising, and enjoyed putting together a variety of ensemble music, including well-known tunes from musicals. The children all got a chance to try out new instruments of all sizes, including a mighty contra-bass flute brought along by Patrick Onn from ‘Top Wind’. Along with a delicious roast lunch, provided by Kent College’s catering team, and an opportunity to meet new people and make new friends, this was a really exciting and most productive day. Thank you to Liz Goodwin from ‘Flutewise’, now in her 30th Year of running such splendid opportunities for young flute players, for putting on such a terrific event. Also thanks to our own flute teacher Jane O’Neill for her vision, encouragement and support in bringing this amazing day to Kent College. Well done all! Every flute player I know loves our Flutewise friend, Gareth Davies. Gareth is principal flute of the London Symphony Orchestra and as well as an exceptional musician he is an extra exceptional person. I was very excited when I heard he had recorded a brand new flute concerto. As flute players, we really do need new repertoire, so a new flute concerto is always welcomed. Douglas Knehans is the composer of tis exciting work, it’s wonderful to listen to, but if you want to play it, you are going to have to work hard! Did I say listen to and play it? I’m one of the lucky few who has heard it. The recording won’t be released until April, but you could win a copy and/or a copy of the music now! Between Gareth, Douglas and myself we’ve come up with 2 competitions - one a very, very easy one and one a little bit harder. See below. 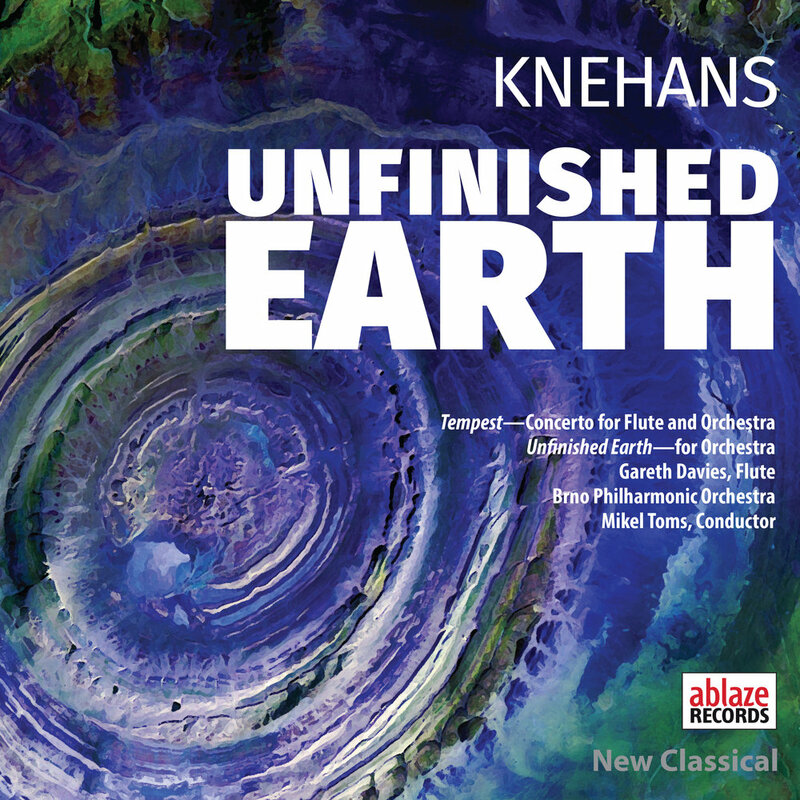 The Album is entitled ‘Unfinished Earth’ and has two works, the flute concerto, ‘Tempest’ and an orchestral work, ‘Unfinished Earth’. The works are performed by the Brno Philharmonic Orchestra conducted by Mikel Toms. “Tempest, my flute concerto, was shaped by the thought of wind—such an essential element to the flute and flute playing—and how, in the natural world, this courses across the planet in different ways from benign to hostile. The three movements reflect different wind patterns found around the globe and served as a departure point for a three movement work cast in a quasi-classical frame of fast-slow-fast structure. Each movement engages a message, I hope, beyond mere tone painting, to reflect deeper aspects of the human condition, the human experience, thought, reflection, psychology and emotion. The highly virtuosic solo part is played Gareth Davies, the principal flute of the London Symphony Orchestra, and he is spectacular. I’m sure you would love to be one of the first people to have a copy of this CD or a copy of the music. So here are the two competitions. You can enter one or both. The closing date will be 14 February when all correct answers will be put into a hat or box or flute case. The lucky winners will be informed by email and announced on our website. If you are lucky enough to live in or near enough to London, I'd really encourage you to get along to these events. The Tempest Flute Trio is amazing! I remember them performing so brilliantly with Gareth Davies a few years ago at our LSO St. Luke's event and I'm disappointed that I haven't heard them since. But we've all got the opportunity to do just that on Sunday 10 December 2017 at Rosemary Branch Theatre, 2 Shepperton Road, London N1 3DT. The performance starts at 7.00 pm and won't last too long if you need to get to bed to get up for school or work the next day. It is an informal concert and there is a pub downstairs that serves excellent food I am told. The Really Christmassy Flute Day!! Come and join Abbie and Gareth for another fun, flute-filled Christmas Spectacular in the heart of London! With warm-ups, workshops, flute choir, mince pies, arts and crafts, flute shopping, carol arrangements and a flutey Christmas PRESENT for all attendees! Come and celebrate Flute Christmas! Are you getting ready for Christmas? Are you stuck for presents? How about asking someone to book you a place on one of our events or courses? 2018 will soon be with us and we've got some great activities that will help us start celebrating 30 years of Flutewise. I hope you will be able to come along and join in some of them. They are guaranteed to help improve your flute playing skills, inspire you and be great fun. Full details of our events are on the website and there will be more events added soon. If you would like to add one of these events as a Christmas present for someone, let me know and I can send a special Flutewise Christmas card to the recipient. We start the year at Kent College, Canterbury on Sunday 14 January with Abbie Burrows and Gareth McLearnon. As well as warm up, workshops on technique and ensemble playing we will be exploring 'Music from the Shows'. Lunch is provided at this event, so to help with catering, please book early. On 3 and 4 February we will be having a Really Flutewise Weekend in Jersey with Mike Mower and Cathy Hare. This is very exciting. If you would like to come for the weekend please get in touch as soon as possible as I can give you a list of recommended places to stay or investigate staying with host families for you. This event is open to players of all ages. Some families from the mainland are already booked to come along. It's a great place for a family weekend break. We'll be back at one of our favourite venues on Sunday 4 March, the Schools at Somerhill, Tonbridge with Abbie Burrows and Gareth McLearnon. The morning session is for adult players and the afternoon is aimed at players up to the age of 18. Our Easter course at Woldingham 3-6 April promises to be very special. The staff will include Jerry Randalls, Chris Baxter and Abbie Burrows. One activity everyone will have the opportunity to be involved in is composing a flute choir piece to celebrate 30 years of Flutewise. Jerry Randalls will be working with Flutewise Apprentice Jess Cooling who is studying composition at university and all of our course members. Just think, your name could be included on a published work! Woldingham is an exceptional venue and the staff are always impressed to see young players gain so much in confidence working in the amazing theatre. Over the weekend of 19 - 20 May the Slovenian Flute Festival takes place. This is always a very special event and everyone who attends loves it. I'll be putting some information about it on our website soon, but if you and your family like the idea to visit Slovenia in May please let me know. The other place you might well be interested in is Flutewise In Croatia during August. It is the most beautiful place and everyone who has been with me over the many years has always expressed the desire to come back (and many have). it is a lovely place to have a family summer holiday added to a very special flute course with Croatian young flute players. I asked the owners of Villa Soulavy to reserve all 7 of their apartments just for Flutewise families and already 4 of them are booked - so if you want to come, hurry! Don't worry if you miss an apartment at the the Villa, there are plenty of other places nearby. I hope that gives you some food for thought. I'll get back to planning a few more events.